Four EMS workers who responded to the arrest of a man who later died in police custody were placed on modified duty a day after an eight-year veteran of the NYPD was stripped of his badge and gun for allegedly using a chokehold while handcuffing the man. The EMS workers, who have not been identified, included two EMTs and two paramedics. The workers are not city employees but work for Richmond University Medical Center, according to the FDNY. On Saturday, Officer Daniel Pantaleo was placed on modified assignment pending further investigation into the arrest of 43-year-old Eric Garner, which was captured on a cellphone video that showed the 43-year-old saying "I can't breathe, I can't breathe" as he was brought to the ground by an officer using a chokehold, a tactic prohibited by NYPD policy. Officials said another officer involved in the arrest, a four-year veteran of the force who has not been identified, had been put on administrative duty but didn't have to surrender his gun or shield. In the video, EMS workers are not shown giving CPR when arriving at the scene. The Staten Island District Attorney's Office is investigating the death of Garner, who was being arrested for allegedly selling untaxed cigarettes on Victory Boulevard and Bay Street in Tompkinsville Thursday afternoon, according to police. While he was being handcuffed, he went into cardiac arrest, police said. He was taken to Richmond University Medical Center, where he was pronounced dead. On Sunday, the medical examiner's officer seemed to deny published reports hinting at preliminary autopsy results. "At this time, no determination has been made by the Medical Examiner's office as to the cause and manner of death of Eric Garner," the office said in a statement. "The cause and manner of death are pending further studies, and no findings will be released until the investigation is complete. Any other information or suggestion to the contrary is simply not true." Earlier in the weekend, the Rev. 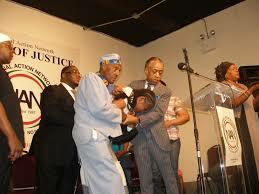 Al Sharpton rallied with supporters and Garner's family. The man's death has sparked community outrage. "The issue is not whether one was selling cigarettes. The issue was how an unarmed man was subjected to a chokehold, and the result is he is no longer with us," Sharpton said after leading the crowd in chants of "no justice, no peace."